So, the first thing many of you will be asking is, “Part 15”? For the benefit of all our new members, let me first cover the basics. Last April I took a big trip to Washington, D.C. and the surrounding region. For some of you, this might not be a big deal. Fair enough. But for a boy born and raised in that other Washington, the Evergreen State, and a transplant to the deserts of Arizona, it was by far the farthest I’d ever been (save Hawai’i). I’m winding this series down, and if you wish, you can see my past installments by browsing here. I’m actually quite embarrassed this will be the first set many of you see, as this was during a night tour, and I didn’t pack a tripod, so the quality is poor on most of these. The night tour by the National Park Service began at Union Station (which I have already covered in a past installment). The park guide reminded me a little of Sammy Davis Jr., with his voice and his jovial humor. When waiting to embark, an old woman who looked homeless, nonchalantly pulled down her skirt, squatted, and did her business in the rose bushes. Some people started giggling a little too loudly for my taste. I thought it was sad. But, maybe that’s how some people deal with uncomfortable situations like that? With aplomb, the guide settled us down and said it was probably good for the roses anyway. I hate to bring race into this – perhaps it’s irrelevant, but I was struck that our guide, whose father was buried in Arlington, who attended Howard University after serving himself, and who now lived in Georgetown must have felt a whole range of emotions as a proud lifelong native Washington D.C. resident and ambassador, and as a black man. I could hear it in his voice. 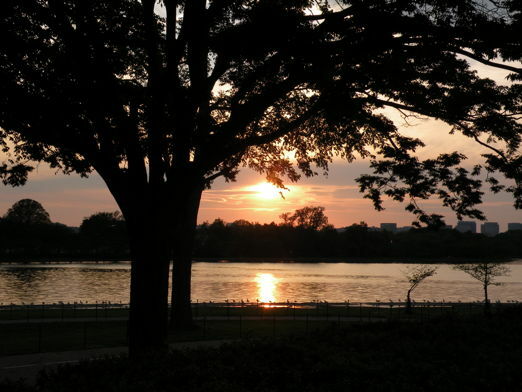 He loved his city, but was keenly aware of the inequity and poverty which still exists almost literally in the shadow of our nation’s Capitol dome. For all the grandeur I saw in Washington, D.C., this did not mar that experience. Rather, I thought it was a needed reminder that so much in our nation has yet to be perfected; or at the very least, first confronted. 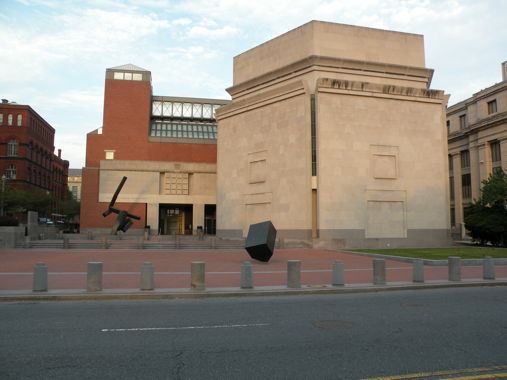 In that vein, we drove past this: the national Holocaust Memorial Museum. I wrote upon this in the past. If you’re ever in D.C., don’t go without visiting this, but remember to go early to get the limited allotment of daily passes for the permanent main museum. I also saw a separate exhibit there on Nazi Propaganda. Yeah, we’ve all read our share about it, but it’s not until you see this exhibit that parallels fully hit you, and I say this without hyperbole (fully aware of Godwin’s law, to certain voices on the right in our own country. 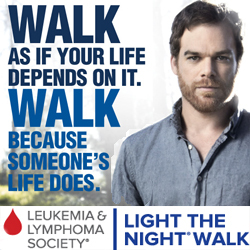 It’s not quite there yet, but it could happen again anywhere under the right circumstances. The methods are chillingly the same. What you see in the front is the Hall of Remembrance. The Jefferson Memorial, at dusk. Taking Wedding photos on the steps. I couldn’t choose between the previous and following picture. I wanted to show the “Stonehenge effect” which I don’t believe was anymore of an accident than being able to see the Eternal Flame of John F. Kennedy at night from across the Arlington Memorial Bridge behind the Lincoln Memorial. As to the quotes on the panels, they can be found here. One can see here it was modeled on the Pantheon. Can you believe this was mocked for its Greco-Roman inspired temple architecture? Wait, wasn’t a presidential candidate also mocked for using such architectural elements at a convention? Maybe they weren’t racist but just hoity-toity architecture critics from the early 1940’s? On to the Franklin Delano Roosevelt Memorial. This was the only memorial I didn’t see during the day. And, from here on the lighting gets difficult for good pictures. Bear with me. A key feature was water. He would have never approved of this next representation, which was dedicated by President Bill Clinton in 2000. It was quite controversial. On one side was the Roosevelt family and on the other the disabled community. I have a few perfectly good pictures of this with flash, but I still opt for the mood of it without flash, though it may be harder to read. Pull yourself up by your bootstraps and get a job! And stop looking for a handout you lazy ingrates! Now to the Korean War Memorial. My pictures of this during the day were better, but the experience of this at night was more moving. I was trying to find makeshift ‘tripods’, but most everything is beveled. Like the Korean War Memorial, the Lincoln Memorial provides a whole different experience at night. I spent time in both the north and south chambers just reading the Second Inaugural Address and Gettysburg Address, respectively. Nothing else mattered to me but those immortal words, not even the cute girls walking by. It was as close to a spiritual moment I’ve had in a long while. There’s just something about that place at night which transforms it from its daytime incarnation. It’s as if the marble comes alive and better resonates the history under the star-spangled blanket of darkness. I’d missed this spot during my daytime visit. The view from that spot (you can barely make out the Washington Monument). I don’t know how I got this. WWII Memorial. I really struggled with which picture to choose here. I had a few good angles of this, but, risking another redundancy, settled on this. The Freedom Wall. There are 4,048 stars in total, each representing 100 servicemen who gave their lives. And, to my second moms here at the Planet, I was quite crestfallen when I found youthful indiscretions and medical records prevent me from serving. Apparently, the Navy has standards. Oh well, I tried. Now some trivia instead: who first introduced the bill to build a WWII Memorial? And, I’m back at Union Station closed down for the night, just as after the next installment this series will be as well. Mid-Atlantic Trip Part I: D.C. Fantastic. The last time I did the monument tour was in ’76 so thanks for the insight into places I never dreamed existed. The ghosts of Korea are so much more powerful at night. New monuments every day, sad nature of conflict. I can only wonder what the Iraq/Afghanistan monuments will look like. I hope they use sandstone or something, even though it’d be quite different. At long last, I’ve had a chance to sit down and really look at the DC by night exhibit, Khirad. It’s beautiful. I’m a night person, so the mood and lighting in the photos is very comfortable for me. That couldn’t have been more beautifully said. I think you’re right about the Roosevelt statue. He would not have approved. Rightly or wrongly, he took fierce pride in not appearing publicly in his chair. But I also get the other POV, too. It looked as though many a sympathetic hand rubbed the bronze shoulders of the guys waiting in the soup line…they’re so shiny. What a really unique way to see Washington. I’ve been there more than once, but never thought to take a night tour. There are many good things in store for you. Just thought you’d be interested in the trivia answer too, kes. Actually, there was a feisty old geezer here who nagged Marcy into getting the ball rolling on that memorial. But she did an admirable job. And now we’re flying as many WWII vets as possible to DC to get a look at it while they still can. Khirad, this has been such a great series. I look forward to the next installment and I’m ardently hoping that you plan to do some more traveling this summer. Since people like looking at pictures of places, well, I’ve got plenty of those. Just not any more of the East Coast. Think of it not as the end, but a new beginning. I like the way you say that. Khirad, I am so glad to know the Lincoln Memorial had an emotional reaction for you as well. Could you feel his deep, deep sadness? It seemed he was still grieving for his country. It was like that at day too, but muffled by the bustle. It was at night that I really got the full effect. And yes, there was a mournful feel to it. Loved your pictures and your commentary, K! 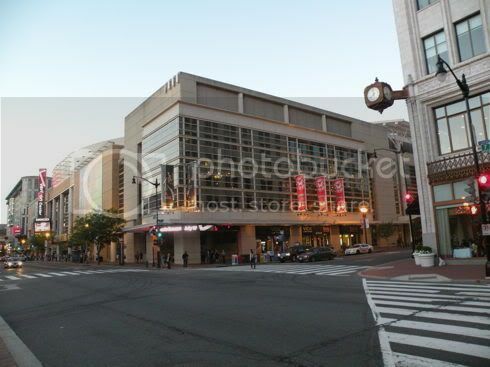 You couldn’t get ONE PICTURE of the Verizon Center where the Washington Wizards play! How long were you in Washington!!! I call this a missed opportunity. And, I was eating in a nearby restaurant packed full of jersey wearing Caps fans before a playoff game against the Canadiens. Our resident hockey fans probably would have gotten more out of that than me. Wonderful pics. I went on that night tour as well, I am sure I have my pics in a box somewhere. That Korean memorial is absolutely fascinating, the images on the walls were almost haunting. Thanks for sharing, it brings back memories of great times. I used to spend one week of every month in that area so I saw alot of what you have talked about in the series and had a lot of good times there with friends. My links got lost while me and our fearless leader, AdLib were working to resolve this new glitch of WordPress, so here they are quickly. Just added all of this at the end of the article. Really value and appreciate how much you invest in these posts, sorry you had such a hassle! But, in the end, here it is! Thanks for getting the formatting right and lending me a hand with some of your time and the quick fix there! Great article, Khirad! I’ve always wanted to visit our nation’s capital, but I have yet to get there. These pictures make me want to go that much more, but I’m waiting ’till I can spend a good chunk of time (and I’m not broke, which could mean never). Cheers for sharing your travels Khirad. Growing up in the suburbs of NYC and visiting there often nothing surprises me about human behavior. Washington is one of my favorite cities to visit mostly because of the museums and monuments. Of course the two Americas are nowhere more on display than in that city. It’s been two Americas for decades. One hypocrisy about the two Americas that gets me was the fact that it only started mattering recently when when more white folks are entering the 2nd citizen America because for way too many African Americans it’s always been two Americas. Indeed, I think it’s really symbolic that it is so apparent in our nation’s capital. You’d think that there would be more impetus fixing it there than anywhere else, but as you said, I think race really played a part in ignoring it (not to say Appalachia and poor rural white communities don’t have their own issues here). One doesn’t have to go far from the Capitol Steps to see the rundown stoops and poverty in D.C. You know, the areas which Beck warned his baggers not to get off the “wrong” Metro stop to see. I do hope they weren’t too hassled to ride with all those black folk though. On a positive note, I’ve never seen such a pro-Obama city! Blinged out Obama shirts were still worn with pride. And, given the history of the city, one can see why. Thanks for visiting and writing about my beautiful city. As a native of D.C. I get kind of tired of it only being affiliated with crooked politicians. It is our nation’s capitol and a beautiful city in its own right. I heard some visitors behind me on the street yesterday talking about how nice it was and clean and easy to get around. I felt like your tour guide at Arlington, bursting with pride. It is really clean! And very easy to get around in, especially with the Metro. I haven’t even read your article or looked at your comments yet Khirad but -- hoooorrrrraaaaay -- you’re back!! OK -- back now!! I’m not much of a traveller but I can say I’ve been to Washington back in the early 80’s with hubby and my grandmother (who would have bee in her mid-to late 80’s herself). 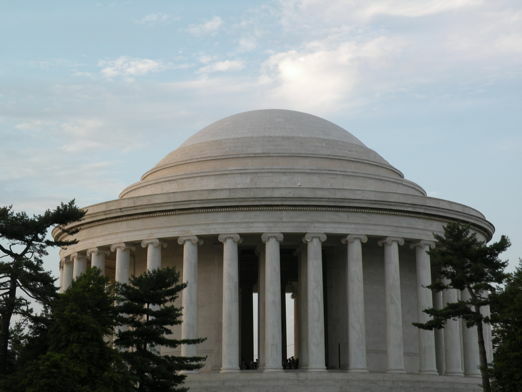 The Jefferson and Lincoln Memorials were built to be overwhelming and full of grandeur and they succeeded beyond their wildest dreams with me -- what an amazing, almost churchlike, atmosphere in there -- we found ourselves whispering to each other! I wish I had seen the FDR memorial and especially the Korean War memorial -- what inspiration to have statues like that down at ground level rather than up on pedestals. It must have been especially eerie and, yes, moving as you say, to see it at night. I’ve really enjoyed riding alongside you on your Grand Tour, Khirad, and I’ll be sorry when it comes to an end. Well, depending on when you went, the FDR and WWII memorials are relatively new. I know I’ll have to go back to see the Martin Luther King, Jr. Memorial one day. Paulita -- all the comments below mine were made while Khirad’s article was pending -- a video was posted about the Technical Difficulties ….. it does seem a little odd now that Khirad’s article is up and running but nobody was dissing him, honest!! I do have to bring that Spanish Flea back though! Check out the go-go senoritas. And dancing with their braids! That’s “Tijuana Taxi,” isn’t it? It sounds kinda like a game show theme song. The marimba solo is cool. TT is correct, sir! The 60’s seemed more earnest than now. At least I had the early 90’s when music seemed once again a bit more earnest. WTF happened?! I don’t know. I stopped listening to the commercial radio and the Top 40 playlist in the early 80’s. Everything just went downhill fast. Before market research became the glittering gem of science it is today, record companies used to have to take a chance on performing artists. Who knew what people would listen to? Better just sign a lot of bands and see what happens. Music has always been a commodity of course, but the industry just didn’t have the tools to produce a purely cynical product before. If art is to be good, the process of making it must be sincere. In my opinion, that’s what was lost in commercial music. Determining who would make it was part of the artistry of the record producer. In that way it became a collaboration. They saw the artist and wondered where they might fit and maybe even transform the music world. Now, it’s how the “artist” is shoe-horned into the industry of music commodities that are averaged out for guaranteed success. Audio-tuning is available to those who can’t really sing. Just put a beat to it l and pseudo-rappify it all.